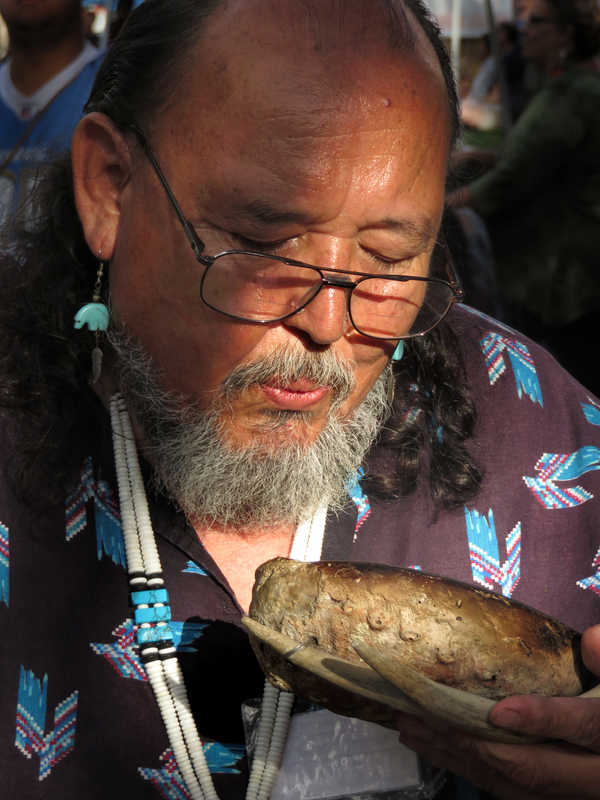 September 28, 2014 — Local Chief Ted Garcia Jr. brings up the smoke from burning sage in a traditional abalone shell in preparation for a smudging, or blessing, at the Hart of the West Powwow at William S. Hart Park in Newhall. Sage is used for cleansing; the smoke carries away negativity. 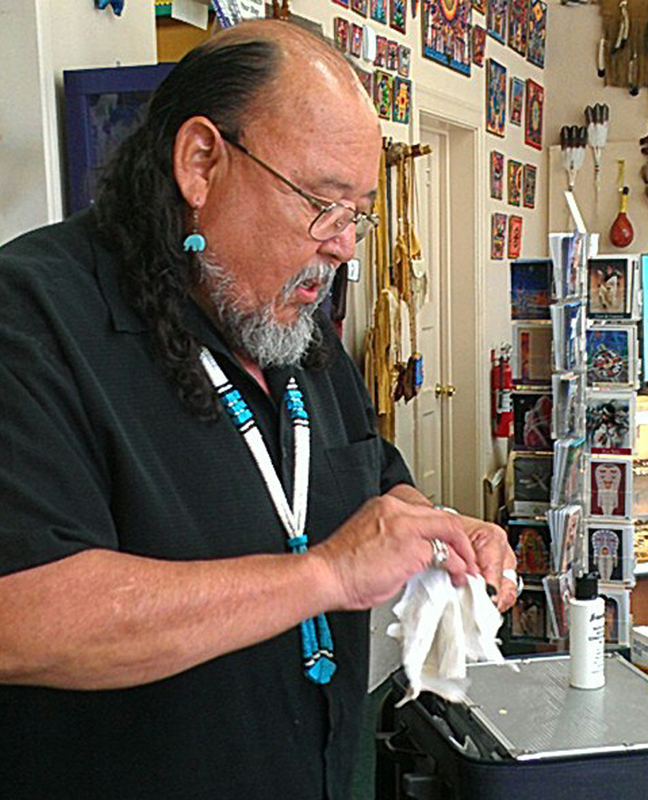 Ted A. Garcia is chief of the Southern Chumash (having succeeded Charlie Cooke in December 2008) and spiritual advisor to the Hart of the West Powwow in Newhall. His Tataviam, Chumash, Tongva and Vanyume ancestors lived in the Santa Clarita, San Fernando and Antelope valleys, as well as parts of Ventura County. Ted's father, Ted C. Garcia, and grandmother, Chief Mary Cooke Garcia, lived in Newhall and are direct descendants of individuals who lived at Chaguayabit village (now Castaic Junction) prior to European contact in 1769. Ted's gr-gr-gr-grandfather Santiago Garcia was born to American Indian and Californio parents about 1833 when the Mission period ended. Santiago settled in the Little Rock Creek area, just above modern-day Acton. (Acton lies in Santiago Canyon, which is named for him.) One of Santiago's sons, Isidoro Garcia — Ted's gr-gr-grandfather — subsequently homesteaded in upper San Francisquito Canyon. Their forebears carved utilitarian as well as ceremonial and decorative objects from native steatite (soapstone). Ted has studied the artifacts to understand the ancient culture's subjects and style. 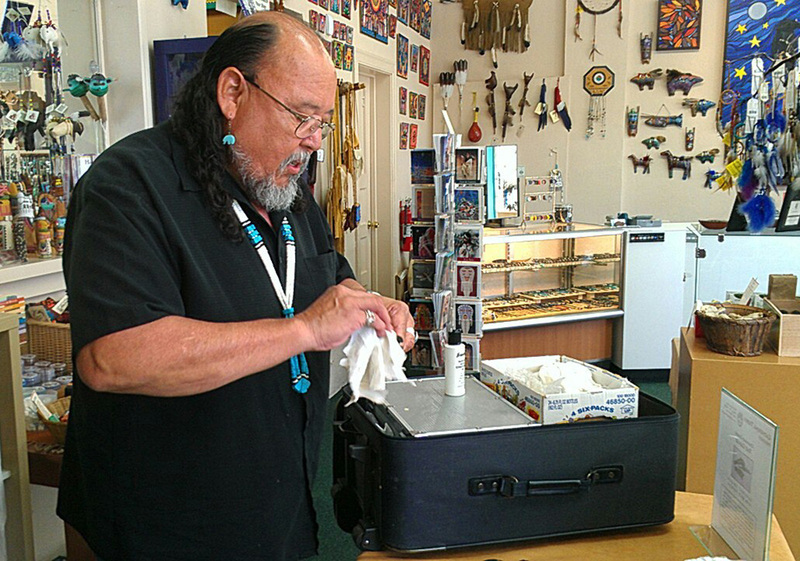 Keeping the traditions alive, he executes small, finely crafted sculptures from locally sourced stone, often using steatite that he gathers in the Santa Clarita Valley. LW2668: 19200 dpi jpeg from digital image by Leon Worden.